Henry Cejudo is an Olympic gold medal wrestler, winning the Freestyle 55 kg (121 lbs.) weight class in Bejing’s 2008 Games. 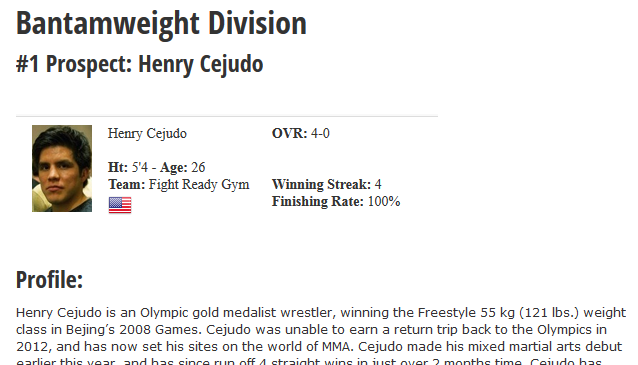 Cejudo was unable to earn a return trip back to the Olympics in 2012, and has now set his sites on the MMA world. Cejudo made his mixed martial arts debut earlier this year, and has since run off 4 straight wins in just over 2 months time. Cejudo has mentioned in interviews that his goal is to fight 8 times per year. Cejudo has been working on his boxing as of late and he has thus far been willing to stand and trade with some of his opponents, though he has left himself open to some counter punches. Don’t be fooled though, Cejudo’s powerful double leg takedowns are what will likely make him a future title contender in either the UFC or Bellator. Cejudo wrestled at 121 lbs., and has already hinted at fighting as a Flyweight if pushed to do so, but for now he seems content to test his skills in the Bantamweight Divison. It has not been announced where Cejudo is currently training, though it is likely somewhere around his home base of Arizona. Cejudo has mentioned that he is just starting to train in BJJ and Muay Thai. He would be wise to link himself to a camp that can truly build around his wrestling prowess. It’s not if Cejudo will become a world champion in MMA, it’s just a matter of when. Cejudo’s wrestling skills alone would make him a likely Top 10 contender in either the UFC’s Flyweight or Bantamweight divisions. That is a bold statement, but after watching Cejudo’s first few fights, his explosiveness and finishing skills already look to be at an elite level. 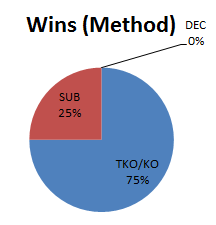 Cejudo still has to round out his game with BJJ and increasing his overall awareness with the diverse striking games his opponents may have such as Muay Thai. Cejudo is on the shorter side for the Bantamweight division. In fact, if he were to sign with the UFC today, he would be tied (Jorgensen, Yamamoto) for the shortest height in the division. Cejudo’s wrestling would more than make up for his lack of size, but the question becomes, is Cejudo fighting at his optimal weight. Only time will tell, but at least Cejudo will have the option of cutting down to Flyweight should he run into some difficulties at 135 lbs. Demetrious Johnson and Joseph Benavidez both followed that path after coming up short in their pursuit of Bantamweight gold.